Zippers and TSA-approved locks are about as good at securing your suitcase as leaving your doors unlocked and using The Club to protect your car. They only keep honest people honest. Well, to paraphrase Doc Brown, "Where we're going, we don't need zippers". Trunkster, a totally zipperless suitcase, packs a digital scale, internal GPS, and a USB charging station -- all in one lightweight case. Travelers Jesse Potash and Gaston Blanchet got tired of hauling around luggage that made accessing their belongings difficult, so they designed the Trunkster. A sliding rolltop door replaces the need for a zipper allowing quick access to whatever’s inside. 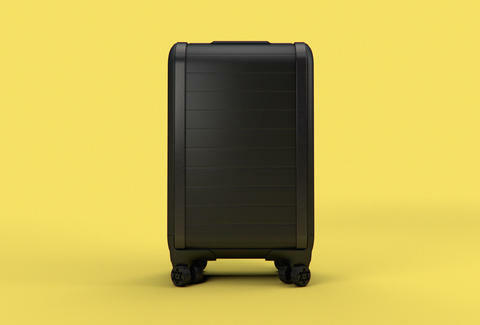 And the airplane-grade aluminum and polycarbonate design makes the suitcase look pretty slick. Overweight luggage fees? Not with this self-weighing suitcase. Even better, you can charge your phone up to nine times with the Trunkster’s charging port, and the USB and battery are both completely removable. 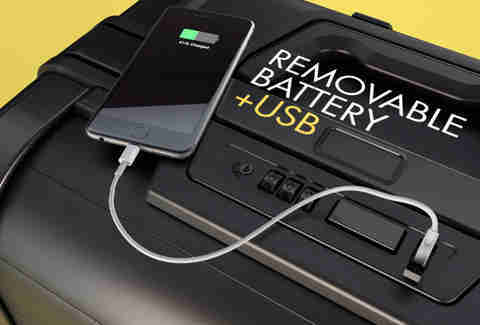 You won’t have to sit next to your suitcase to use your near-dead phone, which is pretty cool. Though you shouldn't leave your suitcase unattended, because of that whole "If you see something, say something" thing. There's also a TSA-approved lock to make sure no one steals your stuff. But even if the whole bag does go missing, you can track it with the built-in GPS. The gadgetry seems pretty cool. Cool enough, in fact, that it's already quadrupled its $50,000 goal on Kickstarter. Available in two sizes -- carry-on (22’’ x 14’’ x 9’’) and checked (27’’ x 19’’ x 11’’) -- the Trunkster’s estimated to retail around $500 for the carry-on and $600 for the checked version. Innovation doesn't come cheap. Before you can pick up your Trunkster next August, watch the video below to learn more, and put in your order here. Chloe Pantazi is an editorial assistant on Thrillist's travel team. She wishes they made these in pink. Follow her on Twitter at @ChloePantazi.